California is well-known as one of the world's most popular tourist locations due to its celebrated cultural history and outstanding natural beauty. When most people think of California, their minds float naturally towards Los Angeles and Hollywood, but one of the state's most precious gems is undoubtedly the Channel Islands. This awesome archipelago is a true delight, providing eight individual islands to see and explore. It's no surprise that kayaking around the Channel Islands is becoming more and more popular, with additional kayaking companies and tours being offered with each passing year. Companies like Island Kayaking and Santa Barbara Adventure Company run various tours around the area, including ocean exploration and cave kayaking. Visitors also have the option to simply rent their own kayaks and explore the islands themselves or take some lessons to learn the basics before heading out. With so many great kayaking spots all around California, what sets the Channel Islands apart? Well, the first big advantage of this area is the unique wildlife all around, both above and beneath the surface of the water. As one of the richest marine ecosystems on the entire planet, kayaking around the Channel Islands gives people a chance to get in touch with some incredible denizens of the deep, including orange garibaldi, California moray eels, giant black sea bass, bat rays, and countless other species. Sea lions can also be spotted floating up to the surface, and the islands themselves are home to all sorts of other creatures include skunk, sheep, and dozens of species of seabirds. 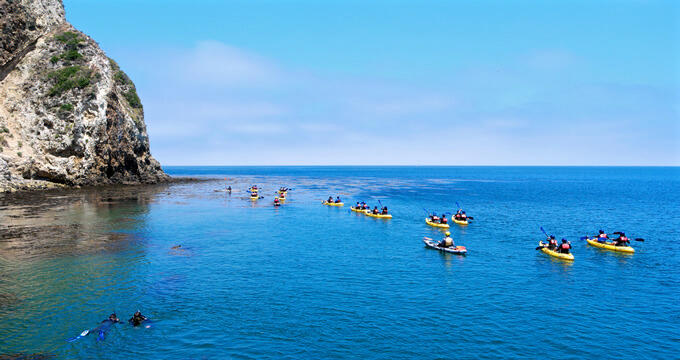 In addition to all that wildlife, the second major reason why anyone would want to go kayaking around the California Channel Islands is simply to appreciate the beautiful views of the ocean and surrounding area. The islands themselves are entirely unique and exciting to explore, with a variety of fascinating rock formations and sea caves to paddle around. The sights, smells, and sounds of the Pacific Ocean are like nothing else, and the Channel Islands really give you a great way to experience all of that beauty without having to battle against the harsh open waters. There are all sorts of fun, educational, exciting kayaking tours to enjoy around the Channel Islands. The most popular tours often sell out in advance, so it's smart to do your research ahead of time and reserve the kayaking tours that interest you the most. One of the top-rated kayaking trips in the Channel Islands is offered by Blue Ocean Kayaking. Starting off with an introductory class for any beginners, this tour focuses on one of the smaller but more spectacular islands: Anacapa Island. With opportunities to see dolphins, whales, fish, and birds, this full-day tour is a great way to make some lifelong memories, running all along the shoreline of Anacapa, taking in the sights and sounds of the island, as well as exploring the various rock formations and caves along the way. Another highly popular Channel Islands kayaking tour is the Adventure Sea Cave Kayak tour by Channel Islands Adventure Company. This half-day tour is suitable for everyone aged 5 and above and is perfect for beginners, spending several hours exploring the various sea caves on and around Santa Cruz Island. This island has more caves than any ever and boasts some of the prettiest rock formations anywhere in the world. If you only have time to enjoy one kayaking trip at the Channel Islands and really want to experience the beauty of the islands' caves, this is the tour for you. Kayakers on this tour might also be lucky enough to spot dolphins and turtles, with several species often being spotted off the coast of Santa Cruz Island. If you have some kayaking experience and really want to make the most of your trip to the Channel Islands, the Ultimate Sea Cave Kayak tour with Channel Islands Adventure Company is the very best kayaking tour for you. One of the longest and most intensive tours offered in the region, this tour involves around 4 miles of paddling and lasts for a full day, taking in some of the less touristic spots of the Channel Islands and revealing some of the hidden gems of this awe-inspiring archipelago. Snorkeling is also available as part of this tour, which takes in a myriad of sea caves and kelp forests along a carefully planned route, providing a simply spectacular overall experience.